Finally I get to post my February results. Even though February was only two days ago, I’ve actually closed off February because I get my paycheck on the 25th. 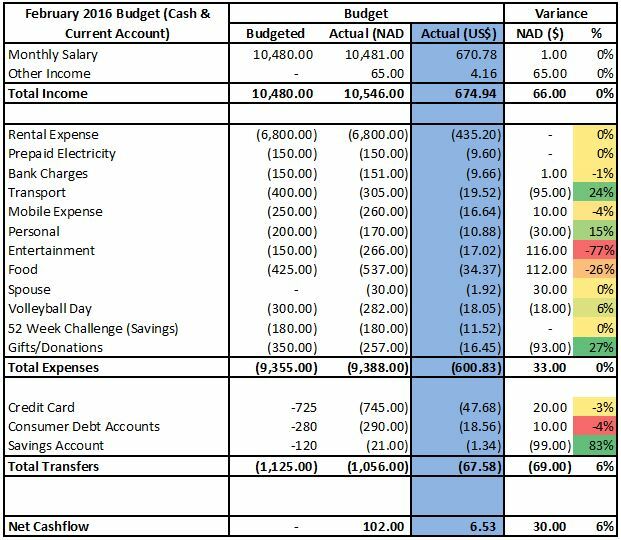 It just complicates things if I don’t close off the month before I get new money in because who’s to say what expense belongs to the previous budget and which expense belongs to the new budget. I had to steal time from work to get this done. My time away from work is dominated by school and my wife, so my finances get neglected. I hope my boss doesn’t find out. I am not going to go into too much detail here, just give a short summary. I am going to create a page for each month and you can find it under the menu item “Finances”. A link will be posted. Entertainment: These two expense items took a major hit. My entertainment budget was blown on the same day I received my paycheck. It’s been so long that I didn’t have money in the bank, so as soon as I got it, I went out for beers with my mates. Totally worth it. Food: The food is higher than I thought it would be. About 70% of the food budget was snacks. There are two outliers, the time my sister, my wife and I went for frozen yogurt and the other time I bought biltong (aka beef jerky). Hopefully there won’t be a repeat of that, but I’ve adjusted my new budget. Transport: I didn’t use the cab as much as I thought I would. My wife uses the car cause she needs it for work to run a couple of company errands, but she drops me off at work in the mornings. In the evenings I take a cab to school and then back home. I budgeted a little extra if I have to catch a cab to anywhere else beside school and home. I lowered this budget in the new month. Donations: I feel bad that this category is underspent. My wife and I didn’t go to church in February, well we did, to another church, but not to our church. Therefore I didn’t spend what I set out to. I’m definitely going to church this Sunday. Personal: This one is a bit of strange. I usually spend a lot on myself. I guess I didn’t as much this month. Whoop whoop. Savings: I can’t remember when I posted about the Bank Your Change, a savings initiative from my bank whereby every time I use my debit card to purchase something at a store, the bank deducts an extra amount over and about the purchase price and then puts that money into my savings account. I didn’t reach my budgeted savings for this initiative because I forgot one crucial detail, I don’t do the grocery shopping anymore, my wife does. So I’m not saving as much as I would. I could’ve just transferred the money I didn’t save by using my debit card, but it’s easier to save when you know you aren’t saving. Well that’s it for February. Not a bad month after all. The Volleyball Tournament my friends and I played was a huge success. No categories have been grossly overspent and my net value is moving in a positive direction. More on that soon and I’ll post my March budget as well. 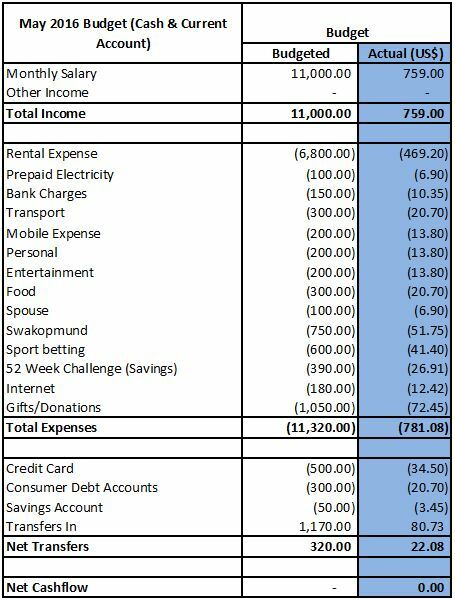 I started with my budget for December/January 2016. I used to draw up a budget every month but lately I’ve just been winging it. I would spend a lot of money the first week after I receive my paycheck then hit the breaks on my spending for the 3 remaining weeks of the month.